Samford University's Ida V. Moffett School of Nursing has received $25,804 to provide support for students in the nurse anesthesia program. This is the 11th year for Samford to receive a Nurse Anesthesia Traineeship (NAT) grant from the U.S. Department of Health and Human Services, Health Resources and Services Administration (HRSA). Nurse Anesthesia traineeships can be used to pay the costs of tuition, books, fees, and reasonable living expenses of trainees. In 2014-15, 48 students will benefit from the grant; to be eligible for funding students must be in good academic standing and possess full-time status. All students who meet the criteria receive a portion of the funds. According to Terri M. Cahoon, chair of the Department of Nurse Anesthesia and grant administrator, these funds are particularly important because nurse anesthesia students are unable to work during the program, and many of the students have families and are living below the poverty line. "Because our students are unable to work during our full-time program, there is often a hardship regarding meeting expenses for things like books, tuition and fees," said Cahoon. "Students typically rely on family support and government and private loans to finance their education, and the traineeships allow us to help alleviate some of the financial burden," Cahoon added. To date, Samford has received more than $188,000 through the HRSA NAT Program and the 2014-15 award is the largest in the school's history. The NAT Program, gives special consideration to nurse anesthesia programs who demonstrate a "high rate" of graduates practicing in Health Professional Shortage Areas (HPSAs) after graduation, contingent to receiving some type of student assistance. According to Cahoon, the Samford program consistently graduates students who seek opportunities in rural and underserved areas of the southeast. Seventy percent of the class of 2013 is currently employed in HPSA or medically underserved communities and approximately 62 percent of the current students who receive traineeship funds are from disadvantaged backgrounds or rural/underserved areas within Alabama or neighboring states. Through the NAT project, the Department of Nurse Anesthesia seeks to prepare students to practice at the highest level for all patient groups, but especially rural and medically underserved patients of all age groups; increase the diversity of the student body to reflect the increased diversity of health care consumers; Increase the students' involvement in community service and culturally appropriate health promotion and care; and increase the number of graduates serving in rural and underserved areas of Alabama and the southeast. The Samford curriculum is a comprehensive program of study that addresses the full anesthesia scope of practice, based on professional organizational standards and current state-of-the-art practice models. Intercultural understanding is woven throughout the program curriculum and clinical experiences. 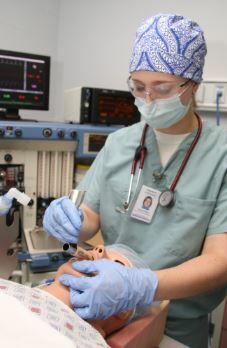 To learn more about the Department of Nurse Anesthesia, go to http://www.samford.edu/nursing/msn-anesthesia/.